Gangplank Slipholders Association (GPSA): Nov. 7 Community Tree Planting a Success! Nov. 7 Community Tree Planting a Success! 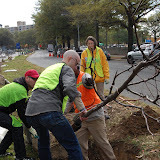 We had over 80 volunteers help plant 22 honey locust trees in the Median of Maine Ave. between 6th and 7th streets SW. We also planted one additional tree in the GP parking lot near the mailboxes. We hope these trees will have a calming effect on traffic and a positive impact the environment and aesthetic beauty in SW DC. The event served as a wonderful opportunity to bring folks from all across the city together to focus on improving our community. This is just the beginning, however. Now we will need volunteers to help water the trees in the Spring. Please be send an email to GPSA if you are interested in helping out.